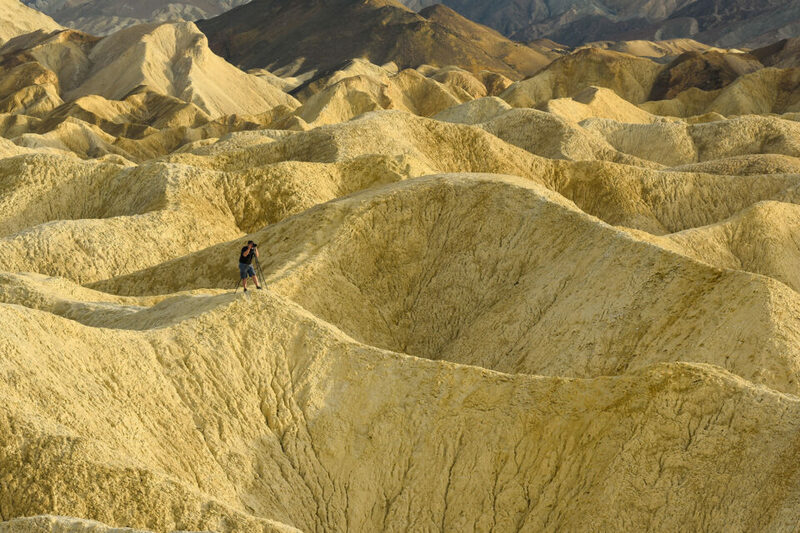 Directions: Drive to Furnace Creek in Death Valley National Park, California. Zabriskie Point is 4.8 miles east along Highway 190. There is a parking area and bathrooms, and a short walk up to the overlook area. Death Valley has some of the most unusual colors you’ll ever see in a landscape, and the Zabriskie area is no exception. It’s an alien landscape of maze-like canary yellow ridges tiger striped with chocolate browns. It has ravines of pistachio green rock topped with pink gravel—bizarre and wonderful. You don’t need clouds to make a beautiful photo as the surrounding mountains can make a dusky red, brown or even blue background depending on the light. 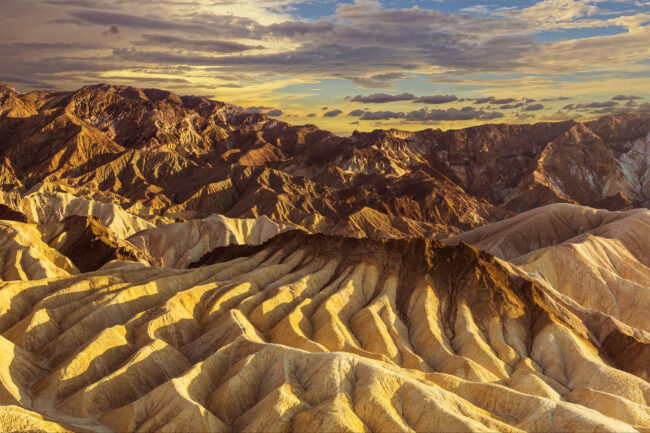 * A valley with detailed erosion features, including a brown topped central mound. * The shark fin with striped rock in the foreground, and plains and mountains for the background. To get the best shadows in the valley plan your visit between May and July (the hottest months unfortunately). You don’t need to be confined to the overlook area. If you go east on Highway 190 for a quarter of a mile, you can cross over a dry river bed and hike into the valley. If you do, you’ll be rewarded with a different look at the shark fin, and interesting foreground opportunities. 1. Furnace Creek is an affordable place to camp or rent a room, and it’s very close which is great for early morning shooting. 2. Be careful of the heat. Wear a hat, bring plenty of water. 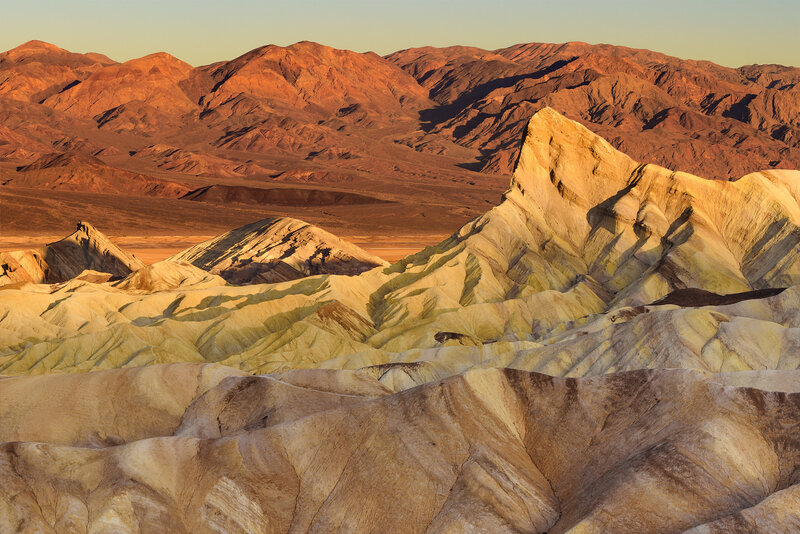 It’s easy to get heat stroke, and Death Valley can reach 130 degrees in the summer. After sunset the temperature drops in a hurry, so be prepared. It can also be windy. 3. Be sure to bring a selection of lenses because Zabriskie works well for wide angle, panoramas and detailed shots of the shark fin. I recommend focal lengths from 14mm to 135mm. 1. The best time to photograph the shark fin is in the morning. Shoot it pre-dawn to get beautiful soft-light, or just after sunrise for golden hour light on the fin and shadows in the foreground. 2. For a panorama of the shark fin and the plains beyond use 50mm – 85mm of focal length. For detailed shots use a focal length of 100mm or more. 3. The afternoon during the summer is the best time to shoot the valley and erosion features. When the sun is very low, it creates high contrast shadows on the ridges. 4. For the valley use wide angle lenses. There is so much detail to capture, you really can’t go too wide, or shoot a big panorama.